Many times, though, subway rides can be pretty fun, especially when the car is suddenly taken over by a mariachi band or a hip-hop dance crew. I've even experienced a magic act, complete with a top-hatted magician, a live bird and disappearing/reappearing underwear. I'm serious. Looking at subway happenings is the idea behind PLATFORM, an arts initiative by the New York Transit Museum that presents a series of cross-disciplinary performances inspired by commuting. Choreographer Jamie Benson and his Shakedown Dance Collective are participating in this season's PLATFORM on Wednesday, April 1. I spoke with Benson ahead of the performance. Have you always been an NYC commuter? I moved from L.A. to NYC a few years ago. 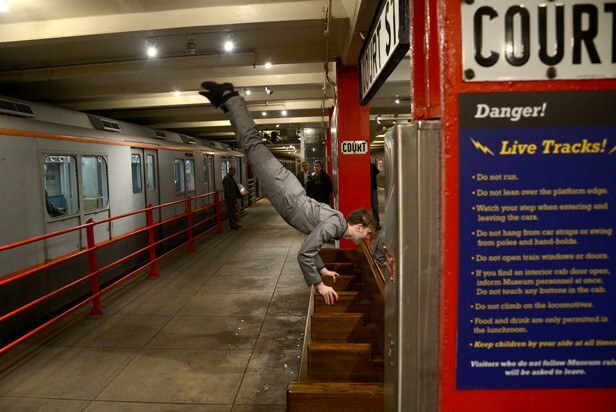 I wanted to explore my "quirk" as a choreographer a little more, and I feel that in NYC, quirk is more respected than it is in L.A.
You've made a few other pieces inspired by mass transit. What interests you about commuting? I'm fascinated by haphazard, or accidental, communities that get created when a big cross-section of humanity is in a tiny space. I love exploring what happens when people who wouldn’t normally ever be together are thrown together. That tension propels our understanding of a city, or just life in general. How did you create Third Rail, your piece for PLATFORM? I sent out an online survey to collect transit stories from the public. I asked a few questions about people's experiences, and I'm taking some of those moments and adapting them for dance. So it's a series overlapping moments inspired by real-life transit stories. I imagine you got some crazy stories. Some were pretty outrageous. There was a lot of people getting hit and hitting—both intentionally and unintentionally. There were stories about vomiting, and one about someone dressed as Jesus. But some moments were really touching, like when a punk kid falls asleep on an elderly woman's shoulder and everyone smiles. Of course, there's also #manspreading involved. Take a look at this short preview of Benson's work in rehearsal, and visit his website and the New York Transit Museum's site for details and ticket info.